Kennedy Space Center Visitor Complex in Florida recently opened the new Heroes and Legends attraction featuring the U.S. Astronaut Hall of Fame presented by Boeing. Electrosonic provided AV installation, integration, and show programming for the new attractions. Fourteen Christie Boxer 4K30 projectors, in stereo pairs, project a star field onto a 220-degree screen in the “Through the Eyes of a Hero” 4D multi-sensory theater. Heroes and Legends gives visitors a sense of what it was like to embark on the first human journeys into space. By focusing on the pioneering efforts of the Mercury and Gemini astronauts, it provides background and context to enrich the guest experience across the entire visitor complex. Visitors are greeted by a bas-relief of the Mercury 7 astronauts on the façade of the building. They enter and ascend a ramp where “What is a Hero?” unfolds. The seven-minute multimedia presentation addresses what makes a hero—not only astronauts, but greats like Martin Luther King Jr. and Mark Twain. A pair of ceiling-mounted Christie DWU851-Q projectors display live-action footage on two asymmetrical widescreens. Diamond-shaped tiles around the room feature graphic imagery and hero portraits; models of rockets fill the center of the room. During the show, lighting effects reveal three hidden features: a bicycle, a full-size model robot from “Lost in Space,” and a school desk to complement the presentation. 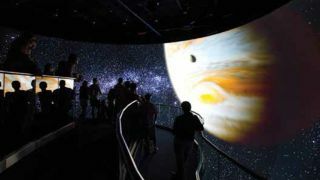 Next, visitors see space exploration “Through the Eyes of a Hero,” in the 4D multi-sensory theater. Fourteen Christie Boxer 4K30 projectors, in stereo (Left Eye/Right Eye) pairs, project a star field onto a roughly 220-degree screen before the show begins. Then the seven-and-a-half-minute video show, complete with wind effects, gives visitors a sense of the danger and excitement of the first manned space missions through the spoken-word experiences of astronauts Alan Shepard, Neil Armstrong, John Glenn, and Jim Lovell. Electrosonic outfitted the Christie Boxers with custom Jenoptik lenses to accommodate the projectors’ placement close to the screen surface, as well as the wraparound, concave shape of the screen itself. Visitors exit onto a mezzanine with a Mercury-Redstone rocket suspended from the ceiling. They descend to the first floor to “A Hero Is...” featuring a host of interactive exhibits and space program artifacts. The former Mercury Mission Control Center is on display with a world map tracking John Glenn’s first orbital flight in 1962. It features two Christie DWU851-Q projectors flanking the tracking board and an array of QSC point source speakers overhead. Nine stand-alone pods detail the attributes of a hero: inspired, curious, passionate, tenacious, disciplined, confident, courageous, principled, and selfless. Visitors entering a pod trigger an IR camera and IR emitter, which prompt a touchscreen where they can call up video about artifacts related to the attribute. The U.S. Astronaut Hall of Fame completes the attraction. A large bronze statue of Alan Shepard, the first American in space, is a focal point at the entrance. The room’s walls are covered with plaques recognizing the 93 inductees to date. Its centerpiece is a 10-foot diameter cylindrical rear-screen projection surface featuring five Christie DWU951-Q projectors. Overhead are angled 70-inch NEC monitors; five touchscreen kiosks ring the projection surface. A montage of images comprises a loop appearing on all the screens; visitors at the kiosks can select their favorite Mercury 7 astronaut for a simulated photo op. Electrosonic employed an array of 7th Sense media servers for Heroes & Legends and the Hall of Fame, including Delta 2, Nano, and Nucleus units, as well as two custom Infinity servers for the 4D theater. The Nassal Company supplied the millwork and metal work; Metal Masters provided custom projector stands and a custom frame for the specialty glass required for the Pepper’s ghost effect. Electrosonic configured a single control room with a row of five fullsize Middle Atlantic MRK series equipment racks. At Electrosonic, Toni Losier and Andrew Kidd were the account executives for the project and Tony Peugh was the senior programmer.